Nikki started communicating with animals in 2002. After 2 decades as an ICU nurse and 18 years as a Reiki Master, she became proficient at working with and translating energy. It was during that time that she discovered that thoughts, intentions and emotions are energy first. The physical body, whether human or animals hold the history of our thoughts and emotions so she began to tune into the subconscious mind to support animals and humans getting to the root of their issues. Animals view the world as energy and use all of their senses, including their 6th sense which is why they sense things that we as humans do not. Humans can be in our analytical minds and mental capacities quite a bit. Animals help us develop our emotional bandwidth and offer the invitation to bridge our minds with our hearts. Nikki loves working with all animals but specializes in working with elite sport performance horses and also has a deep love of working with wild mustangs that have been rounded up off of BLM. 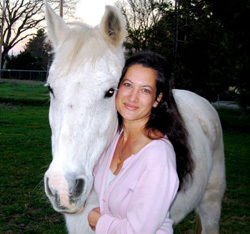 She brings a holistic approach to working with all animals by helping their person understand what the animal is feeling in relationship to their body, training and circumstances. She also focuses on what the owner can contribute to the partnership in terms of actions and deep listening. She incorporates mindfulness base techniques, guided visualizations, breath work and body awareness to competitors so that riders can bring their best selves to their equine friends. Nikki also offers communication with animals that have transitioned into Spirit. Animal Communication Sessions are by phone, Skype or in person (I can travel to your location or you can bring the animal to my studio).